My fresh corn recipes range from grilled corn on the cob (with butter sauce), to delicious corn bread, creamed corn, corn pudding and moist corn cake. Learn how to grill corn, roast corn, boil corn, microwave corn, steam corn, freezer corn, cream corn and more below. Refrigerate corn until ready to use it. Some varieties of sweet corn can lose half their sugar content in one day if kept at room temperature. Leave the husks on to retain moisture. If the ears are already husked, place them in a perforated plastic bag. If you have more corn on hand that you can use in a day or two, parboil it for just one minute or two and refrigerate it up to three days. To complete the process, just drop them into boiling water for one minute. Or, cut the kernels from the cob and then refrigerate. Unless you are grilling or roasting corn in the husk, strip off the husk and snap off the stems (or leave the stems on to use as handles). Pull off the silk, using a dry vegetable brush to remove strands between the kernels. To remove corn from the cob, hold the cob vertically, resting the tip on the work surface, and slide a sharp knife down the length of the cob. For cream-style corn (my fresh corn recipe below for this favorite), slit each row of kernels with a sharp knife and then run the back of the knife down the length of the cob to force out the pulp and juice, leaving the skins of the kernels on the cob. Corn is a source of fiber, magnesium, phosphorous, thiamine and vitamin C. Corn is America's number one field crop for volume and production. These facts were brought to you Whole Foods Market. Now on to my fresh corn recipes. 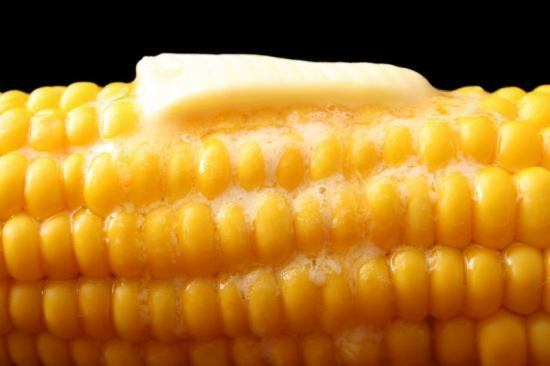 Corn on the cob is better with my homemade butter. 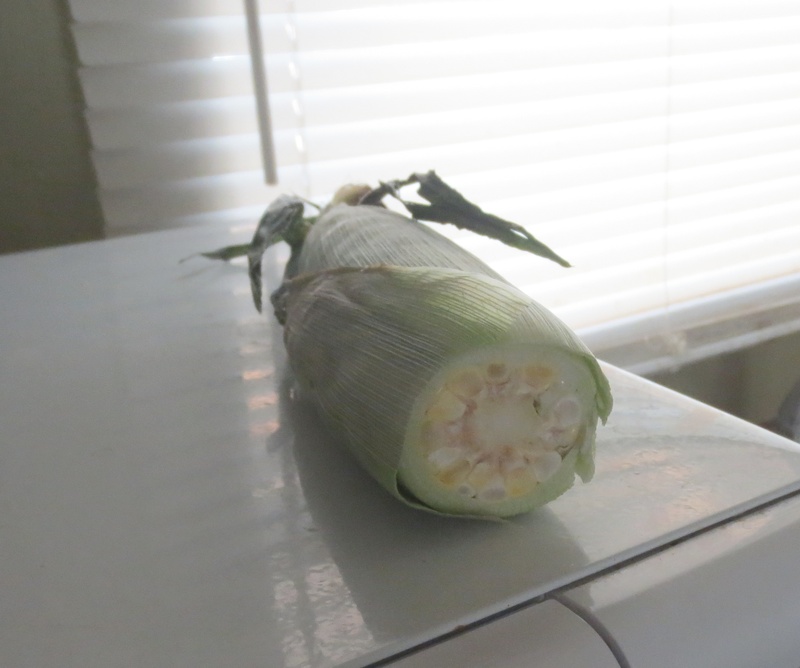 Here's a different way to cook corn on the cob instead of boiling it. PREHEAT oven to 350 degrees. Rinse the ears in place corn cobs in the middle of the oven. Bake for 30 minutes, pull back the husks to eat. It hot outside (even hotter inside). The kids want corn, but you don't want to boil it to make the kitchen feel like a sauna. What do you do? This is my traditional fresh corn recipe. Fill your pot with water and add the above ingredients (except corn). Bring to a boil and then add your corn. Boil for 8-10 minutes or until tender. Serve with butter, salt and pepper. Which fresh corn recipe do you like better? This one or the one above? Put 2 inches of water in the bottom of the pot that you will be cooking your corn in. Add salt. Place the ears in the pot (whole or cut in half) and stack in rows. Put the cover on and bring to a boil. Once it comes to a boil, steam corn for 15 minutes - keeping the lid on. Keep an eye on the water so it doesn't scorch your pan. Make sure there is 2 inches at all times in the bottom of the pan. Great fresh corn recipe. Place 1 tablespoon of butter in each piece of foil; season and roll up the corn and pinch in the sides and place in the outer area of the grill. Cook for twenty minutes, turning every 5 minutes. If it's crackling, it's burning. Serve with more butter. I love this fresh corn recipe. Add the first 4 ingredients in a saucepan until the butter is melted over medium heat. Combine the water and the cornstarch together and stir until it is dissolved. Slowly add this to the corn in the saucepan and reduce the heat to a simmer and stir until sauce thickens. Let simmer for ten minutes and serve. Mix ingredients together and boil for 3 minutes. Cool and pack in freezer bags. This fresh corn recipe is worth it's weight in gold, because in the winter when you serve this corn you'd swear it was as fresh as the day it was picked. PREHEAT approximately 2 inches of oil to 375 degrees. Combine the first 6 ingredients together. Add the honey and then the milk - a little at a time. You want the consistency to be thicker than pancake batter so it sticks to the hot dog. Pour batter into a drinking glass. Dry off the hot dog and pierce through the center of the hot dog. Roll in flour and then dunk in the batter evenly. Fry for 2-1/2 minutes or until golden brown and drain. You may use mini cocktail franks and toothpicks, or you can slice up the hot dog - dip in batter and have "dog bites" which kids love. Spicy sausages work well also. Serve with ketchup, maple syrup or whatever you like. Kids love these and you'll love this easy corn recipe. PREHEAT oven to 400 degrees and lightly grease the mini muffin tins. Stir the cornbread mix and brown sugar together in a bowl. Whisk together the eggs and milk in another bowl. Fold in the grated cheese and egg mixture into the cornbread mix. Spoon some of the batter in the muffin cup and add sliced hot dog until it is 2/3 full. Repeat. Bake for 14-18 minutes or until golden brown. You can add more cheese, jalapeno peppers - whatever you like. I serve them with maple syrup or ketchup. PREHEAT oven to 350 degrees. Grease an 9x9 or 8x8 baking dish. In a medium bowl, beat the butter and slowly add the flour and creamed corn. Next mix together the cornmeal, sugar, salt and baking powder together in a small bowl and add this to the butter mixture. Lastly fold in the kernel corn. Pour into prepared baking dish. Place two inches of water in the bottom of an 9x13 pan and place the baking dish in the water. Pour in the batter and cover with foil. Bake for 50-60 minutes and allow to cool 10 minutes in the pan. Use a ice cream scoop to remove and serve from the pan. This is great with Mexican food and on top of chili. PREHEAT oven to 400 degrees and grease a 8x8 inch pan. In a large bowl, combine the flour, cornmeal, sugar, baking powder, baking soda and salt. 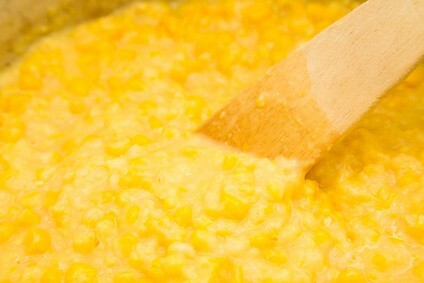 Combine the egg, creamed corn, sour cream, milk and butter and stir into the dry ingredients just until moistened. Do NOT over stir. Pour into the prepared baking dish and bake for 20-25 minutes or until a toothpick inserted in the center comes out clean. Serve warm. PREHEAT oven to 400 degrees and lightly grease muffin tins. Mix butter, sugar, honey, eggs and salt in a bowl. Add flour, cornmeal and baking powder; mix thoroughly. Add the milk while mixing and then add the corn. Fill a muffin tin 2/3 full and bake for 20-25 minutes or until they are lightly brown. Mix together all the corn, sour cream, eggs, butter and sugar. Mix in the muffin mix, stir and spoon into the prepared dish. Bake for 35-40 minutes or until toothpick inserted in the middle comes out clean. Serve immediately. PREHEAT oven to 350 degrees and grease an oblong baking dish. Combine sugar, flour, baking powder and salt. Whisk the eggs, cream and butter together. Gradually add the sugar and flour mixture, stirring until smooth; add corn. Pour into the prepared baking dish and bake for 45-55 minutes or until golden brown and set. Let stand 5 minutes before serving. Prepare cornbread mix according to package directions. Cool and crumble. Melt the butter and saute celery and onion until soft. In a large bowl, combine the celery, onions, 3 cups crumbled cornbread, eggs, chicken stock, sage, salt and pepper. Mix lightly and place in prepared baking dish. Bake for 30 minutes and serve. You may add chopped sausage, shredded ham, hamburger or bacon works well with this recipe. Not really a "corn recipe" but it still makes the grade. Bake cornbread according to directions. Cool and crumble in a large bowl. PREHEAT oven to 375 degrees and get out a 9x13 baking dish. In a large skillet heat the canola oil and fry the sausage until brown and crumbly. Remove sausage from the skillet - keeping the oil in the pan. Next add the onions, apples and celery to the hot oil and fry for 5 minutes. Toss this and the cooked sausage in with the crumbled corn bread. Stir in the chicken broth and melted butter. Season with parsley, sage, thyme, rosemary, salt and pepper. Blend and press into the 9x13 baking dish. Bake for 35 to 45 minutes. Cook on low for 4 hours stirring occasionally. For a large crock pot, triple the ingredients. Another take on the above fresh corn recipe. It's rich and so good. Mix all ingredients together in a large crock pot and cook on low for 3 hours, stirring every 30 minutes. 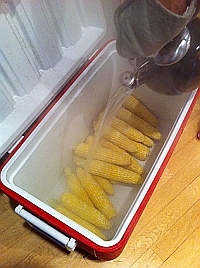 Drain the corn and discard the liquid. Beat eggs, salt and pepper in a bowl - add flour and baking powder and whisk until smooth. Add corn and cheese; whisk until smooth. Place butter and oil in a frying pan and heat until bubbly over medium heat. Drop corn mixture in spoonfuls in the hot oil and fry until golden brown; turn over and cook the other side. Drain and serve. You may also add green onions and green chiles. This fresh corn recipe creates a wonderful soup. Heat butter in a large pot over medium heat. Stir in the onion and cook until translucent and soft. Pour in the chicken broth and bring to a boil. Stir in the garlic, bay leaves, Old Bay and salt/pepper. Stir corn into the boiling broth and simmer about 10 minutes. Lower the heat to medium-low. Remove 1 cup of the soup and set aside to cool slightly - puree this and the 1/2 cup heavy whipping cream in a blender or food processor. Set aside. In a small bowl, stir together the flour and milk - adding slowly to the simmering soup. Stir for two minutes and then add the pureed mixture. Reduce heat to low and add the crab meat - cook until warmed through. Serve with parmesan cheese sprinkled on the top. What a wonderful fresh corn recipe. This is so easy, you are going to think, "Why didn't I think of that?" If any of you are campers, I'm sure you have already made cooler corn. If not, you are going to learn how right now. Shuck the amount of ears you want to cook and place in a clean cooler. Bring two pots of water to a boil and pour over the ears. Place the lid on the corn. In 30 minutes, you have perfectly cooked corn. I know fresh corn is only available here in Wisconsin for 4 to 6 weeks at the end of summer. That's it. I envy those who can eat it all year.